The debate on whether India should maintain the ban on Jallikattu, the bull-taming sporting event of Tamil Nadu, has again trigged the ‘Animal Rights vs. Heritage’ debate. The event, practised for hundreds of years, was outlawed by the Supreme Court in 2014, a decision it maintained in 2016. 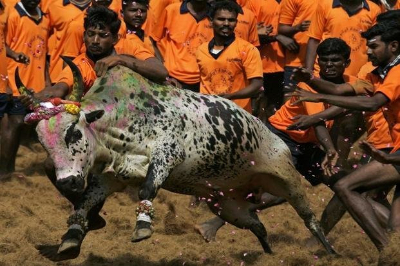 The supporters of Jallikattu allege that this ‘harmless’ festival has been unfairly targeted even as ‘goats and chicken’ are being slaughtered in other festivals. What are the recent developments on Jallikattu? As Pongal approaches, all the political parties in Tamil Nadu and many of its movie stars have unequivocally supported Jallikattu. The Chief Minister wants the government of India to bypass the Supreme Court order (banning Jallikattu) by passing an Ordinance. Chief Minister (CM) O Panneerselvam wrote to Prime Minister Narendra Modi, saying "considering the groundswell of sentiment and support for the conduct of Jallikattu all over Tamil Nadu, this is an issue on which the government of India must act with maximum despatch." "Given that Pongal festival, which holds great importance to the people of Tamil Nadu, is less than a week away and Jallikattu is an integral part of the Pongal festivities, considering the urgency of the issue, Government of India should consider promulgating an ordinance removing the legal impediments, enabling the conduct of Jallikattu during Pongal, 2017," he said in the letter. The CM also wants that the Ministry of Environment and Forests (MoEF) "should clearly denotify" bulls as performing animals from a 2011 notification by the Ministry. The MoEF issued a notification in 2011 that banned the use of bulls as performing animals, thereby banning jallikattu, bull races and bullfights. Veteran actor Kamal Haasan, who has a massive fan following, has said he is a "big fan" of Jallikattu, and believes the ban should be revoked. Hassan also quipped that the activists who want Jallikattu banned should also consider banning biryani, a rice dish that is mixed with meat of chicken or sheep. "I'm probably one of few actors who've played Jallikattu. Am a proud Tamilian, this is our culture," Haasan said. Earlier he has argued that unlike bullfighting events in Spain, bulls aren’t hurt in Jallikattu. In 2008, the Supreme Court banned the practice but the order was reversed within few days by the court by declaring that the tradition can be allowed if certain guidelines were followed. In line with the SC order, a law was introduced in 2009 by the state of Tamil Nadu to regulate Jallikattu. The Ministry of Environment and Forests (MoEF) issued a notification in 2011 that banned the use of bulls as performing animals, thereby banning the sport. But the sport was allowed to be conducted under Tamil Nadu Regulation of Jallikattu Act No 27 of 2009. On 7 May 2014, the Supreme Court of India struck down the state law and banned the sport. 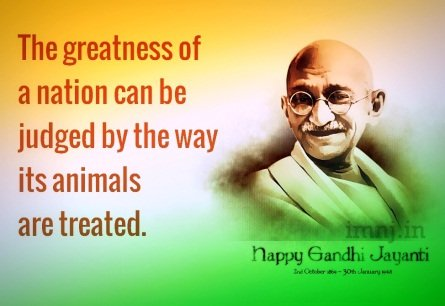 The apex court noted that any flouting of the ban should result in penalties for cruelty to animals under The Prevention of Cruelty to Animals Act, 1960. The court also asked the Government of India to amend the law on preventing cruelty to animals to bring bulls within its ambit. On 8 January 2016, the MoEF permitted the continuation of the tradition “under certain conditions” effectively ending the ban. After hearing the petitions which were led by the Animal Welfare Board of India challenging central government's notification, the Supreme Court of India on 12 January 2016 ordered a stay and issued notices to the central government and Tamil Nadu Government. The apex court in November 2016 dismissed the plea of the Tamil Nadu government seeking review of the 2014 judgment. Why is Jallikattu splitting the nation? Jallikattu has revived the ‘cruelty vs. culture’ debate. 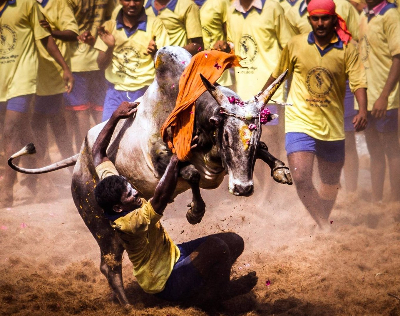 The arguments in favour of Jallikattu invoke culture and tradition to justify the sport. They also say that in the absence of this festival, the bulls may be sent for slaughter (thereby making Jallikattu the saviour of bulls). It is the beef exporters who will benefit from a ban on jallikattu and other such events. Organisers of Jallikattu argue that these are traditional practices closely associated with village life (thereby, banning it is an anti-rural India step). The bulls are specifically trained and nourished for these sporting events, and their owners spend considerable amounts on their upkeep.No tickets are sold for Jallikattu. They argue that the solution to all the allegations is better regulation, not an outright ban. The arguments against Jallikattu focus on the cruelty inflicted on the animals for the pleasure of the watchers and also point out that Jallikattu is not actually central to the culture of Tamil Nadu. They refer to multiple media reports over the last decade, with many headlines screaming about injuries in a Jallikattu event. When did the practice of Jallikattu start? Though bull-fighting has been practiced since ancient times, Jallikattu has been around for over 400 years. The event was recorded in ancient literature as ‘yeru thaluvudal’ (hugging the bull).Initially, it was a ceremony to select a bridegroom — the successful tamer would get to marry the maiden. The name jallikattu is derived from the word ‘salli’ meaning coins and ‘kattu’ meaning bundle/pouch. The pouch, made of yellow cloth, filled with coins, is tied to the bull’s horns. The tamer gets the pouch. The villagers in the southern districts of Tamil Nadu believe that not playing the sport on the third day of the four-day Pongal harvest festival will displease local deities, including lord Muniswara. The supporters of Jallikattu however claim that the festival has been known to be practised during the Tamil classical period (3rd century BC to 4th century AD). It was common among the ancient tribes who lived in the ‘Mullai’ geographical division of the ancient Tamil country. It is true that bullfighting was common among the ancient tribes of Mullai but it was not called Jallikattu at that time. Later, it became a platform for display of bravery and prize money was introduced for entertainment. Undoubtedly, however, bull-fighting was practiced in ancient India. A seal from the Indus Valley Civilization depicting the tradition sport of bull-fighting is preserved in the National Museum, New Delhi. 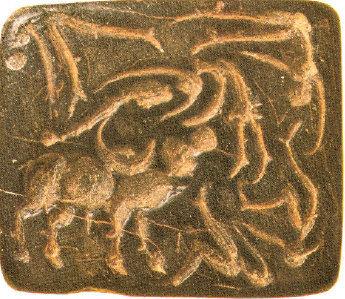 This seal realistically brings alive a vigorous scene of bull-fighting from Mohenjodaro. It portrays a ferocious bull in action, several men or a single man (according to two different interpretations), thrown in the air by it as they try to control it. Clearly, the bull is the victor. This establishes that bull-fighting was practiced in India 4000 years ago. Bull-baiting figures in the Hindu epic Mahabharatha, which describes Krishna controlling a violent bull in the forecourt of Kamsa’s palace. Where are the differences between Jallikattu and Spanish Bull-fighting? The rules of Jallikattu are simple - a trained bull is let into an arena where the players try to catch the bull and hold on it. Also, the participants are allowed to hold the bull only by its humps. Holding necks or horns is not allowed. The participants who manage to hold the humps till the finish line are declared winners. Otherwise, the bull is declared as the winner. Additionally, only one participant is usually allowed to hold onto the hump at a time. Also, these stud bulls are raised and trained to participate in these sports. Most importantly, Jallikattu does not involve any use of sticks, ropes, or other tools that would cause real harm to the bulls. The notorious Spanish Bullfighting is by its very nature cruel towards the Bulls and almost always leads to the bull’s death. There is no race happening here. 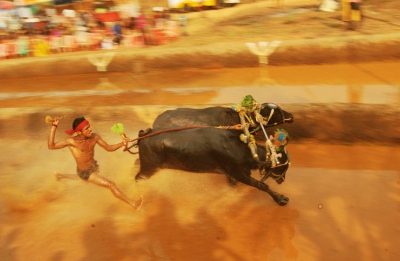 It is quite unlike Jallikattu where human participants and the bull ‘race to the finish’. Instead, the bull is goaded into attacking the participants, so that they can strike it and finally kill it. Spanish-style bullfighting is called corrida de toros (literally "running of bulls") or la fiesta ("the festival"). In the traditional corrida, three Matadors each fight two bulls, each of which is between four and six years old and weighs no less than 460 kg. 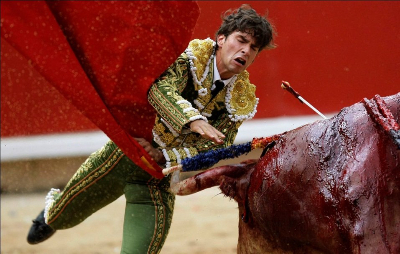 The bull is severely mutilated and injured at each stage of the Bullfight using swords, lances, barbed sticks, etc. It is equally dangerous for the Matadors who take on the bulls. In July 2016, a matador died on live TV after being horn-stabbed by a bull - the first bullfighter to die in the Spanish ring for more than 30 years. Who is leading the fight against Jallikattu? The Animal Welfare Board of India (AWBI) is doing its best to ensure that Jallikattu ban is not revoked by either Tamil Nadu or the central government. It was the AWBI that approached the Supreme Court, which then decided to ban Jallikattu. Ever since, the Board and the ministry of Environment have been at loggerheads, with the latter even asking the board members, who are incidentally appointed by the ministry, to step down. The board members refused to fall in line and the ministry's plan to reportedly appoint pliant members did not succeed. Jallikattu supporters, however, disagree, arguing why would they harm their own bulls, who are like "family members''. "The activists mistake vermilion for chilly powder. Make the rules stringent but allow us to conduct Jallikattu,'' pleads P Rajasekhar, president of the Tamil Nadu Jallikattu Federation. 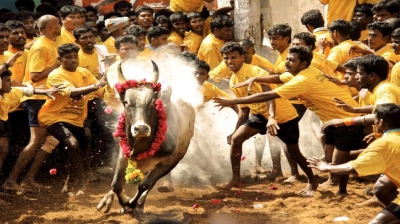 The ruling All India Anna Dravida Munnetra Kazhagam (AIADMK) has called the stance of the Superme Court and the Animal Rights activists disappointing and reminded that Jallikattu is a “socio-cultural rural sport” conducted for centuries. Sometimes, the arguments stretch to the extreme. Locals in Alanganallur, the ground zero of Jallikattu in Madurai, defiantly asked last year how a 69-year-old institution (Supreme Court) can rule over a 450-year-old traditional sport (Jallikattu)! Note: The Supreme Court was actually 66 year-old in 2016. It came into being on 28 January 1950 by replacing both the Federal Court of India and the Judicial Committee of the Privy Council which were then at the apex of the Indian court system. How should the country proceed on Jallikattu? There is surely a case for continuing with Jallikattu. Even under the Convention on Biological Diversity and heritage status practices worldwide, it is customary that these ancient traditional practices are left as they are but with rules to organise and regulate them. If Jallikattu remains banned, livestock keepers will be forced to abandon the raising of native livestock, which already stands threatened due to the extensive use of motor pumps, tractors and mechanised agriculture.If the sport is banned, it may lead to some decline in the native cattle species in Tamil Nadu. Extending an olive branch to animal rights activists, a cabinet note in 2016 wanted to "Amend the relevant provisions of PCA Act 1960 to enhance the fine for infliction of unnecessary pain or suffering on animals to make it more deterrent.'' So the favoured executive solution is – not banning, but regulating it better. However, regulation can be easily violated, especially when all political parties support the continuation of Jallikattu is its pristine form. There has been documented evidence showing that the rules laid down by the Tamil Nadu Regulation of Jallikattu Act (2009), which required the mandatory presence of practising veterinarians, barricades and a host of other guidelines to be followed (no injuring, kicking, pulling or biting the tail, etc. ), were being flouted blatantly. People for Ethical Treatment of Animals (PETA) has repeatedly released video evidence of how the bulls are provoked by piercing with sharp weapons and throwing chilly in their eyes right before the event starts. The bulls are poorly fed so that they can be easily tamed. On a relative level: A constantly cited counter-argument (against the ban) is that people of ‘other religions’ are allowed to kill animals in their festivals; why then single out Jallikattu, which - even if the allegations are true - is not designed to kill animals. The ethical questions cannot be resolved and every individual has to form her own opinion on these. Legally, the Supreme Court has taken a firm stand that Jallikattu inflicts cruelty on the participating bulls. The court, in all its legal wisdom, would surely have gone through all evidence before firming its position.The ban is the law of the land now. Appealing against it may appeal to political constituencies but is unlikely to influence the court. It can be debated forever if the injuries to the bulls are ‘significant enough’ to merit a ban. May be they are. May be they are not. But it cannot be denied that the very basis of Jallikattu is amusement which seeks sanction from religion and culture. After all, we do not do to our family members what we do to the bulls. The government at the center, which swears by its commitment to protect the cows – in the name of religion of course, seeks to allow the torture of bulls in the name of tradition. Politics as usual.